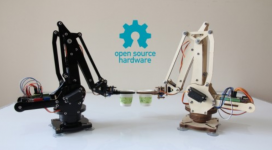 So… another robot arm, another amazing application… we are getting closer to Skynet? Humans can program robots to do lots of things, but robots still falter when it comes to the unpredictability of human life. They’re not great when it comes to responding to objects flying right at them — they’re not likely to jump out of the way. 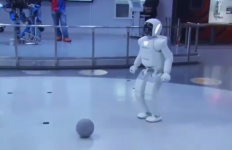 Now, catching those objects is a distinct possibility for robots. At the Learning Algorithms and System Laboratory (LASA) at Switzerland’s EPFL (one of two Swiss Federal Institutes of Technology), researchers combined parts from two robots to make a remarkable robotic arm that catches objects. In the video above, the somewhat oversized, four-fingered hand is able to catch anything from a tennis racket to a partially-filled water bottle. “I think the main novelty we bring to object-catching is the way we transfer information from a human to the robot,” said LASA researcher Ashwini Shukla in the video. 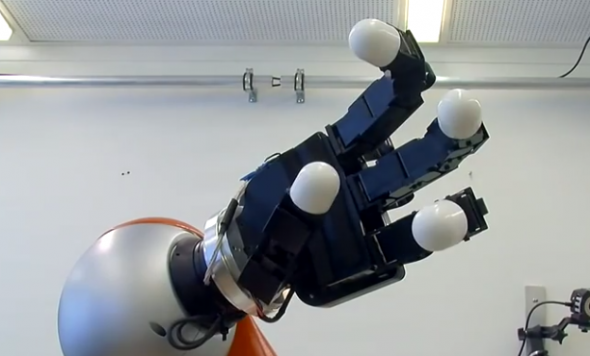 Researchers took a lightweight robot arm from German company KUKA and attached an Allegro Hand from SimLab. KUKA’s lightweight robot (the LBR) is notable because it can be trained by movement, so LASA researchers attached the hand and physically guided the robot arm through the motion of catching various objects, while guiding cameras watched. This “programming by demonstration” allowed the arm and hand to build a model of the various objects flying through the air and then applied that information to catching the objects on its own. The end result is a multi-jointed, tabletop robot arm that displays incredible speed and agility — and, at least in the video, never misses a catch. While the robot arm is fun to watch, it works toward a serious goal, according to Billard, who founded the LASA lab in 2002. 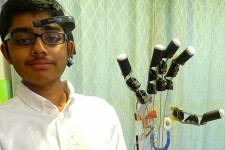 They want to build a robot that can adjust to changing environments and situations in a fraction of a second. They want to build a robot that can adjust to changing environments and situations in a fraction of a second. Imagine, for instance, a robot catching someone before he falls or grasping a falling object before it hits someone on the head. Billard says the research could also lead to better in-car reaction systems to help drivers avoid collisions. Major leaguers should take note, too. The robot’s response time is quick enough to catch a fastball thrown by a Major League Baseball pitcher, Billard said, as long as a high-speed camera is on the field. She added that catching a fastball is actually easier than catching a tennis racket, because the robot doesn’t need to adopt a particular orientation; when catching a tennis racket, the robot must align the orientation of its hand with that of the racket. Next, the LASA lab is working on applying this technology to a robot that can catch debris in space for the Swiss Space Center. On Make: The new Parrot drone – The Bebop!